Owning your very own tennis court is a dream come true for any sports loving resident of Melbourne, and our synthetic tennis courts will make it a reality. Easy to maintain and even quicker to install, our synthetic tennis courts will have you swinging the racket around in no time at all. We make our courts to the highest standards of quality and playability possible, providing a great surface that will bounce true and be comfortable under foot. Coming in a wide range of colours, from the traditional green to the iconic clay brown, you can have your favourite tennis court surface right on your own property. It’s not all just about the look, however. We have a range of both short pile and long pile surfaces that can fine tune the playing style of your new artificial tennis court. Opt for a shorter length to mimic the fastest hardcourts in the world, or a longer pile to slow it down as a grass or clay tennis court would – the choice is yours. Why pick a synthetic tennis court? Predominantly used heavily in the warmer months, tennis courts can often be neglected during the winter period. This can lead to problems, such as weeds or long growth, or buildups of clay and the exposure of the clay bed. Maintaining and repairing these damages can be very expensive, not to mention the time needed to rectify the matters. An artificial tennis court largely removes the need for ongoing maintenance, presenting a much more affordable and hassle-free alternative in the long run. Synthetic tennis courts can last for a long time to come, too, withstanding anything that the weather throws at it and being very durable under the expected use. 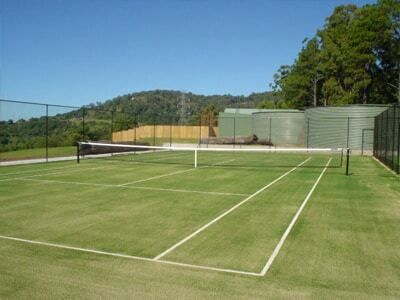 Why choose us to install your Artificial tennis court? For over ten years, we’ve been installing the highest quality of synthetic tennis courts all across Melbourne for both recreational and competitive use. Our experience over the journey has meant that we have the tools and the know-how to have your artificial tennis court installed quickly and professionally, without any problems occurring later on. If needed, we can also be called on to provide maintenance and repairs to even the oldest of artificial tennis courts. We’ll be able to fix tears, flatness, and even stretching through our particular expertise, and you won’t be able to tell where the problem was once we’re done. We can do all of this for a great price, too. Whether you own a tennis club and are looking for an easier solution for your players, or you simply like to have a hit as recreation, get in touch with us today! We’ll give you a great quote on your new synthetic tennis court after listening to exactly what it is you want, and with our installation procedure, will have you out on the court in no time at all.